Federalismo e igualdade territorial: uma contradição em termos? Fédéralisme et égalité territoriale: une contradiction entre les termes? Translation from Dados – Revista de Ciências Sociais, v. 53, n.3, pp. 587-620, 2010. The study explores the relationship between federalism and territorial inequality, taking Brazil as the object of analysis. The conclusion is that there is a trade-off between territorial inequality reduction and the full autonomy of local governments. The central government's redistributive role seems to be a condition for reducing revenue inequality between jurisdictions, and so reducing inequality in citizens' access to public services requires the central government to perform redistributive and regulatory role. On the other hand, local autonomy pushes toward inequality. Hence, federal regulation and local autonomy are combined in a given polity, the result tends to be bound inequality. Dans ce travail, on examine les relations entre fédéralisme et inégalité territoriale, le Brésil étant l'objet d'étude. On conclut qu'il y a un compromis entre la réduction des inégalités territoriales et la pleine autonomie des autorités locales. Le rôle redistributif du gouvernement central semble une condition pour réduire des inégalités interjuridictionnelles du revenu et, par conséquent, l'inégalité d'accès des citoyens aux services publics dans le cadre d'un état nation. En outre, le produit de l'autonomie local is inégalité. Donc, quand on trouve régulation fédérale et autonomie locale, le resultat le plus probable est que l'inégalité soit controlé au-dedans de certains intervalles. Analysts of Brazil's contemporary political institutions employ the expression, "the particular nature of Brazilian Federalism", when speaking about one of the institutions that is assumed to negatively influence the Brazilian state capacity to provide public policy. The adoption of a federal formula appears to be an artifice of sorts, because Brazilian society does not reflect the ethnic or religious cleavages that typically justify the adoption of consociative arrangements (Lamounier, 1992). Additionally, the formula adopted by Brazil falls within the most decentralized federations in the world (Stepan, 1999; Shah, 2006). Local governments are conferred excessive autonomy and, as a result, have limited incentives for horizontal cooperation. Predatory intergovernmental relations and the absence of coordination are typically the result of this sort of subnational autonomy (Abrucio and Soares, 2001). Given the veto power of local interests in federal decision-making arenas, distributive negotiations become one of the currencies in Brazilian politics. Consequently, pork barrel politics via amendments to the federal budget constitute one of the president's first-order instruments for obtaining the cooperation of parliamentarians (Pereira and Mueller, 2002). Finally, just as federalism contributes to the fragility of parties, it might also explain the weak correspondence between policies executed by subnational governments and their partisan sponsors (Ribeiro, 2005; Satyro, 2008; Sakurai, 2009). In short, current Brazilian federal institutions compromise the efficiency and effectiveness of the Brazilian State. Among other inconsistencies, the standing institutional arrangement should weaken the ability of the Brazilian State to guarantee the rights of citizens. This article explores the above interpretations, which shed light on the operation of Brazilian policies, and indeed, the State itself. I argue, however, that these interpretations disregard two equally relevant factors for the adoption and functioning of Brazil's federalism, namely, regional cleavages and the relationships between the central and subnational governments. The interpretation that Brazil's subnational governments possess excessive autonomy is based on empirical evidence pointing to the comparatively elevated share of total public spending appropriated by subnational governments. In addition, the interpretation is based on the extensiveness of subnational competencies in policy-making as the status of municipalities in the federation. The inference that Brazilian political life is dominated by particularist negotiations is, in turn, based on propositions that relate to the impact of electoral rules on the behavior of parliamentarians. In sum, the autonomy of subnational governments and electoral rules produce perverse incentives that affect the calculations of local governing officials and parliamentarians. The result, in turn, is that the territorial and social integration of the Brazilian State is compromised - compromising the primary function of a modern nation-state. The second analytical premise centers on Brazil's central-local relations. The decentralized way of how Brazil's policies are implemented is compatible with the centralization of authority. Comparative studies reveal that local/intermediate/state governance can be strongly affected by central-local relations (Obinger et al, 2005, Sellers e Lidström, 2007; Razin, 2007), such that the political priorities of subnational governments can be forcefully affected by the structure of incentives coming from higher levels of government (Arretche, 2000)2. An adequate analysis of these relations, in turn, requires identifying two distinct dimensions of authority: policy formulation, and the implementation of public policies. As Pierson (1995:451) proposed, "'federal systems superimpose the question of 'who should do it?' over the question of 'what is to be done?'" In the Brazilian case, distinguishing who is in charge of policy formulation and who is charge of implementing it permits us to infer that subnational government agendas are highly affected by federal regulation when it comes to tax collection, the allocation of spending, and the implementation of public policies - even as they play a comparatively important and unusual role in public spending, and the provision of public services. The legitimacy of federal regulation, in turn, has deep roots in the Brazilian nation-state formation. The principle that a central government be endowed with the instruments to legislate and supervise the actions of subnational governments finds its basis not only in the idea of nationhood, but also in the distrust of local political elites. To explore these questions, this article examines the outputs of public policies. The study takes Brazil's municipalities as its unit of analysis3. In line with international standards (Banting, 2006), the policies that guarantee income remain the central government's responsibility (social security, social assistance, and unemployment insurance), whereas service-focused policies are implemented by territorial governments. However, unlike most federations, basic services such as health, education, urban infrastructure, housing, and sanitation are the responsibility of municipal governments as well as municipalities are not creatures of states. The second part of the analysis consists of identifying the effects of central-local relations on the supply of municipal services. First, assuming that municipalities are unequal on their capacity to raise revenues, it is possible to evaluate the redistributive role of higher-level governments before and after the "treatment" produced by the former intervention. It is therefore possible to draw a link between the effects of a reduction in inequality among municipalities and the fiscal and taxing schemes of the Brazilian federation. Second, assuming that Brazilian municipalities are similar as providers of public services, the existence of differently regulated policies permits an exploration of the effects of federal regulation on the spending of local governments. In summary, central-local relations are a primary analytical variable. Their effects on the decisions of municipal governments, as well as the inequality among jurisdictions, allows us to test the proposition that current Brazilian federal institutions have deleterious effects on the provision of public services. The analysis covers the period 1996 to 2006, and uses as its source the Database of Municipal Information from the Centro de Estudos da Metrópole (the Center for Metropolitan Studies). The article advances evidence to show that the Union concentrates regulatory authority in order to create institutional mechanisms that help reduce place-inequality. However, local governments' authority tends to produce divergences on the implementation of their own public policies. Consequently, federal states that combine centralized authority and the political autonomy of local governments tend to restrict levels of territorial inequality. This result can be explained by two apparently contradictory tendencies: the regulatory role of the central government operates toward uniformity, whereas local governance operates toward divergence. This interaction implies inequality among jurisdictions, but it tends to vary within certain intervals. Within this context, the most probable outcome is bounded place-inequality. This article is organized into four sections, in addition to the introduction and conclusion. The first section summarizes the main institutional theories on federalism and territorial inequality. The second section explores the origins of centralized political authority within the context of Brazilian federalism, highlighting important aspects of Brazil's formation as a nation-state. The third section describes tax and fiscal rules the redistributive impact of transfers. In the fourth section, the federal regulation of local government spending is examined, as well as its effect on territorial inequality. Institutional theories permit us to expect distinct results in federal states in relation to the dissimilarity of policies among territorial jurisdictions. One of the most influential argues that federalism implies inequality, since "[...] uniformity is antithetical to federalism. [â¦], there is no escape from a compelling truth: federalism and equality of result cannot coexist" (Wildavsky, 1984:57-68). This result might be explained by a foundational institutional mechanism: federal states allow for divergence among constituent units. The possibility of discord, in turn, creates mechanisms that favor policy differentiation. Â Once jurisdictions discord, the inevitable result will be some form of policy inequality. The theory of public choice has developed a model for an ideal federation, drawing from the influential article of Charles Tiebout (1956). According to this theory, efficient and responsible local governments will promote competition for taxpayers who possess inter-jurisdictional mobility. Based on this premise, Weingast (1995) and Buchanan (1995) proposed an ideal State model, in which (i) policy decision-making authority and the implementation of policies ought to be highly decentralized; and, (ii) the redistributive role of the central government should be strictly limited. According to this Tieboutian viewpoint, it is not realistic to expect that central governments can efficiently undertake redistributive functions. Distributive policies are not able to produce a reduction in territorial inequalities because they inevitably tend to degrade into pork barrel politics. That is to say that local spending will reflect the clientilistic interests of powerful coalitions in the central decision-making arenas. The theoretical propositions of this school permit us to expect two possible outcomes in federal states. The first refers to the probable results in the face of national redistributive policies. Within this context, transfers will be directed toward the districts of powerful political elites with the greatest regional power. These will not necessarily be the neediest districts. As a result, redistributive policies will not obtain redistributive results. A second expectation stipulates that in federal contexts there will be strong competition among jurisdictions, whereby citizens and businesses "vote with their feet" (Tiebout, 1956). This situation is believed to lead to a "race to the bottom" in redistributive policies, because the dominant strategy of local governments is to free themselves from the poor in order to attract richer firms and citizens (Peterson, 1995). Therefore, in none of the possible scenarios do federal states produce a reduction in territorial inequality. Finally, a third school argues that federal states are not antithetical to the reduction of inequality among jurisdictions. By contrast, these theorists hold that federalism can create institutions to efficiently reduce inequalities, as exemplified by the well-studied case of Germany. However, this result requires centralized decision making authority. "Substantial redistribution can be effectively achieved only at the national level" (Obinger, Leibfried and Castles, 2005:352). They continue, "[it is] the specificity of the central framework and the strength of interregional redistribution [that] set the structural underpinnings of the balance between social citizenship and regional diversity" (Banting e Corbett, 2002:22). Therefore, in federal states that centralize the formulation of policies then implemented by subnational units, units which benefit from a system of inter-jurisdictional transfers of wealth, it is possible to encounter reductions in territorial inequalities. According to this theory, therefore, the regulatory and redistributive roles of the central government are the mechanisms needed to obtain cooperation among jurisdictions. However, this sort of commitment will only be possible in federal states with fragile regional identities. That is to say, those in which the nation coincides territorially with the State. In the thinking of Stein Rokkan, this presupposes that citizens start from a common belief that they are part of one national community. Reducing territorial inequalities implies a heavy price. This tends to be a zero-sum game in which the federal government gains the authority to regulate lower levels of government, and these, in turn, find their decision-making authority necessarily limited. Note how the expectations of public choice theory and historical neo-institutionalism are compatible. Both share the idea that there is a trade-off between redistribution - or the reduction of territorial inequalities - and the centralization of political authority. In some federations, the process of the nation-state formation was accompanied by a commitment distinguished by homogeneous national rules. Such is the case of Germany (Manow, 2005) and Austria (Obinger, 2005). The process of nation-state formation in Brazil concentrated decision-making power in the central government, in addition to regulatory and spending power. In democratic periods, solidly instituted normative orientations tended to give higher priority to homogenous national policies than to regional demands for autonomy. Inequality among jurisdictions to perform governing functions gave rise to the centralization of the authority on taxing, planning, and even on policy implementation. Similarly, authoritarian regimes (1930-34; 1937-45, and 1964-85) suppressed the autonomy of subnational units for extended periods. In effect, the centralization of the Union occurred at the end of the First Republic (1891-1930). Elites feared what would befall the nation given the incapacity of the provinces and peripheries to undertake governing functions in the social (Hochman, 2006) and economic realms (Oliveira, 1977; Schwartzman, 1982)4. Beginning in the 1930s, the central government assumed a central role in the planning and financing of economic activity, which presupposed the centralization of political authority (Draibe, 1985; Nunes, 1997; Sikkink, 1993; Souza, 1976). The centralization of tax collection permitted the Brazilian developmentalist state to allocate considerable revenues to the goal of diminishing regional inequalities. This economic imperative was accompanied by federal initiatives to supervise federal policies at the subnational level (Arretche, 2006). The federal supervision of subnational governments was also justified by the conditions of local politics, namely, the pervasiveness of corruption and clientilism (Leal, 1949). The authoritarian rulers of the 1920s provided a justification for the authoritarian regime installed in the 1930s. They did so by claiming that the political autonomy of the states represented an instrument by which backwards regional oligarchies manipulated and exploited ignorant electors. The danger was that these oligarchies were able to impede the initiatives of a modernizing central government (Mota, 1982). Combating corruption and local-level patronage also figured prominently among the justifications for the suppression of regional autonomy by the military regime that took power in 1964 (Carvalho, 2001). Finally, legislation that regulated the finances of subnational governments beginning in the mid 1990s was justified in the Chamber of Deputies through the claim that policies of great importance could not be left in the hands of local politicians (Arretche, 2007, 2009). Therefore, far from a Tieboutian vision, the notion that federal supervision of local politics can efficiently protect citizens against backwards, corrupt elites is deeply embedded in Brazilian history. Currently, this vision is shared among progressive elites, even those who favor decentralization in the implementation of public policies (Almeida, 2005). However, homogeneous national rules do not necessarily imply equal results. Instead, different factors explain persistent social and regional inequalities in Brazil. First, economic advances have been concentrated in the South and Southeast regions. As a result, subnational governments' taxable bases vary a lot. In spite of the fact that national redistributive policies do aim at reducing revenue-inequality among jurisdictions, their outcomes are limited by the high levels of inequality on subnational self-generated revenues. Therefore, rather than fully reducing territorial inequality, redistributive policies have indeed only alleviated it. Social policies in Brazil, by their turn, were modeled according to values inspired by conservative welfare regimes since their very inception in the 1930s (Draibe, 1989, Esping-Andersen, 1990). Not surprisingly, these policies have fundamentally produced status differences among different categories of citizens. The rights of citizens were unequally attributed in accordance with their position in the workplace. The result is that policies awarded social benefits relative to the worker power in the job market. In a context of high unemployment and income inequality, these entitlement rules reinforced exclusion and segregation instead of reducing socio-economic inequalities. In response to the challenges of territorial integration, the Brazilian nation-state formation tended toward centralization (Almond and Powell, 1978).Â High rates of economic growth were accompanied by inequalities in the geographic and social distribution of wealth, which mostly lay in the South and Southeast. Additionally, unemployment and informality in the workplace - combined with Bismarckian social rights - implied that multitudes remained disenfranchised from social assistance. Finally, to compensate for this unequal participation in the benefits of the welfare system, the response of the developmentalist state was to substitute social rights for political and civic rights, dividing citizens along corporatist lines (Santos, 1979; Carvalho, 2001). Current policies that aim to reduce territorial inequalities are the result of a combination of this centralizing tendency, with fiscal and political reforms approved during the recent period of democracy, from 1988 to the present. The Bismarckian features of policies introduced during the era of President Getulio Vargas and the military regime have found compensation in a trend towards de-commodification:5 the universalization of health and education, as well as a non-contributive component in the social security system. To the same end, the federal government expanded regulation and supervision over subnational governments beginning in the 1990s. The goal was to prioritize spending on health and education, as well as to ensure fiscal discipline - among other ends. In short, a solid tradition of federal regulation was once again employed to implement compensatory policies that would address social and geographic inequalities. Brazil's experience shows that - apart from a general identity of belonging to a national community (the concept of nationhood) - distrust in the willingness of local elites to implement and respect the rights of citizens can serve as powerful source toward centralizing political authority, even in federal states. Under these circumstances, even progressive elites favorably disposed to the local implementation of public policies prefer that the federal government regulate the way in which these policies are implemented. The idea is to tie the hands of governors and mayors who, it is assumed, are eager to convert federal resources into conservative, corrupt, and clientilistic policies. As previously discussed, an adequate interpretation of decentralization requires a conceptual distinction between responsibility for policy-making and the authority for policy decision-making. This implies avoiding a frequently employed analytical inference: deducing the latter from empirical evidence about the former. To a large extent, the proposition regarding the autonomy of subnational governments in Brazil is compromised by the conflation of these two concepts. Fleshing-out this analytical distinction allows for a considerably more accurate interpretation of the Brazilian federation and the dynamics of implementing decentralized policies. Given the historical processes summarized in the previous section, it should be clear that the central government possesses considerable tools to regulate subnational governments. Â Their taxing and spending decisions - at both the state and municipal level - are significantly limited by national legislation. Furthermore, the provision of public services and the allocation of spending are strong influenced by federal legislation and supervision. The result is that, although constituent units are politically autonomous and have responsibility for tax collection and policy implementation, their decision-making autonomy cannot be adequately interpreted if we ignore how subnational agendas are affected by federal regulation. Therefore, any analysis of the territorial inequalities affecting Brazilian citizens requires an examination of national policies. Homogenous federal rules govern the tax authority of Brazil's constituent units. Local and state governments are not authorized to freely collect taxes, even if their citizens accept to pay them. Unlike a Tieboutian world, municipal governments are authorized to tax only urban property, services and the transfer of property. They are forbidden to tax any other taxable basis. Therefore, the taxation authority of municipal governments in Brazil is limited to defining their own tax rates. The revenue streams of municipal government do include, however, constitutionally mandated transfers. The distribution of these transfers is governed by multiple criteria. The rules that regulate the transfers of the Municipal Participation Fund (Fundo de Participação dos Municípios) exhibit a redistributive imperative, although their effectiveness is highly controversial.6 Currently, this Fund consists of 23.5 percent of federal revenues from two taxes: income tax, and the Tax on Industrialized Products (Imposto sobre Produtos Industrializados). Ten percent is distributed among capital cities, and 90 percent among the remaining ones, such that each individual disbursement is calculated by a formula that is inversely proportional to the population and revenues per capita of each respective state (Afonso and Araújo, 2006). In practice, this formula has been frozen since 1989 (Rezende, 2006). Finally, a fourth component of municipal revenues comes from universal conditional transfers. These transfers became universal on the early 1990s and are, therefore, a more recent tool employed to reduce revenue-based territorial inequalities. They are also compulsory earmarked to specific policies. In health care, they became universal in 19988 upon the completion of subnational adhesion to the Unified Health System (Sistema Único de Saúde), initiated in 1990. These transfers are earmarked to cover from basic health care to hospitalization. They are universal in the sense that all municipalities that fulfill the requisite criteria established by the Operational Norms of the Ministry of Health (Normas Operacionais do Ministério da Saúde) are eligible to receive them. They are also universal because virtually 100 percent of Brazil's municipalities opted to follow the rules of the Unified Health System. Figure 1 presents the impact of each revenue source in municipal budgets. If Brazilian municipalities were to rely only upon their self-generated tax collection, their average budget would add up to a total of around R$ 100 per capita. Constitutional transfers - from the federal and state governments to municipalities - represent a significant increase in resources for municipal coffers. During the period 1996 to 2006, these levels increased to close to R$ 800 per capita in 2006, but as early as 1996 these funds were by far the main source of revenue for municipal governments. For their part, universal conditional transfers have had an additional positive impact. These have grown significantly since their introduction in 1988, and elevated average revenues hovered around R$ 1000 by 2006. As illustrated by Figure 1, the remaining transfers have had minimal budgetary impact. This indicator is mostly irrelevant, because it reveals that the impact of negotiated transfers on municipal revenues is marginal. In short, it tells us little relative to the other indicators that provide data on transfers. Therefore, it is clear that a significant part of municipal revenues lies outside the realm of political bargaining, because their distribution is mandated constitutionally. Hence, although negotiated transfers possess some relevance for political negotiations between the president and parliamentarians, their ultimate impact on municipal resources is much less relevant than assumed. Mayors receive resources from the central government independent of their political affiliation or political behavior. Although additional resources may be welcome, the supply of local public services does not depend on political relations, whether they be partisan or individual. Most statistical analyses on the impact of constitutional transfers do not distinguish between federal or state transfers. One exception is Biderman (2005), who disaggregated them and demonstrated that federal transfers are progressive whereas state transfers, regressive. In effect, taking central-local relations seriously requires this analytical distinction. As previously observed, the allocation of these transfers is governed by multiple criteria. Figure 2 disaggregates the different revenue streams of Brazilian municipalities and presents their respective Gini coefficients. Results are calculated for self-generated tax-collection itself and for additional sources of revenue. The indicators therefore measure the impact of each type of transfer on revenue territorial inequality in relation to self-generated tax collection. In this way, if Brazil's municipalities were to count only on the resources derived from their own tax collection, Gini Coefficients suggest that their spending capacity would be highly unequal (close to 0.550 in 2006, and declining throughout the data series). If Brazil's municipalities were only to count on state-level transfers -- namely, from ICMS and IPVA), in addition to their own self-generated tax revenues, they would be less unequal, since this revenue source reduces the Gini coefficient to approximately 0.450 (although it was only 0.500 at the beginning of the data series). Put differently, the tax collection of municipalities, added to state transfers, in large part reflects the disparities in economic activity across Brazil's municipalities, given that state transfers operate as rebates. Federal transfers reduce a lot self-generated revenue inequality. Their entry into municipal coffers reduces the Gini coefficient by close to 0.300, excluding all other sources of transfers. That is, if Brazilian municipalities could only count on their own tax revenues and on the revenues of the Municipal Participation Fund, their revenue inequality would be cut by half. 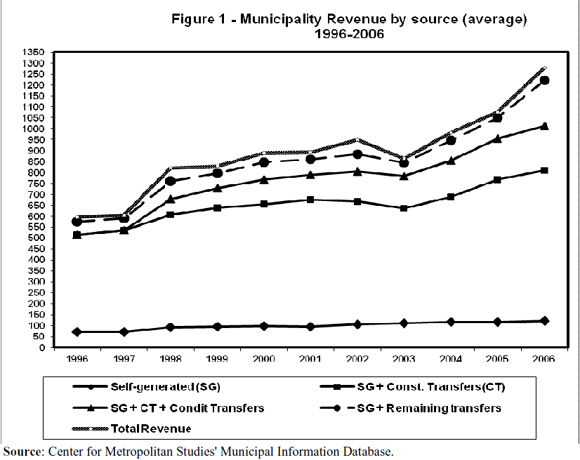 Note that the data presented in Figure 1 indicates that federal transfers are a main components of municipal revenues. The Fund for the Maintenance and Development of Basic Education and the Advancement of Teaching and the Unified Health System's 96 Basic Operational Norm were actually implemented in 1998, which explains why universal conditional transfers began in this year. Their redistributive impact have been significant. If they were the only transfer municipalities had access to, besides municipal self-generated tax collection, their effect on the reduction of revenue inequality would be similar to the Municipal Participation Fund. Beginning in 2003, these policies began to have a more significant impact than all other resources that had previously been marshaled towards reducing revenue inequality among jurisdictions. In isolation, these policies are surely the most redistributive, because in 2006 the transfers of the Unified Health System and the Fund for the Maintenance and Development of Basic Education and the Advancement of Teaching reduced the Gini coefficient to 0.220. However, it is important to note that their global impact on municipal revenues is rather limited (refer to Figure 1). Negotiated transfers had an important effect on reducing revenue inequality, particularly after they were initiated in 2003. Contrary to the expectations of public choice theory, these transfers do not appear to reinforce or reproduce inequality derived from the wealth of each jurisdiction - even if their redistributive effect is more limited than the combined impact of the Municipal Participation Fund, the Unified Health System, and the Fund for the Maintenance and Development of Basic Education and the Advancement of Teaching. Finally, municipal revenue sources altogether hover around a Gini coefficient of 0.280. 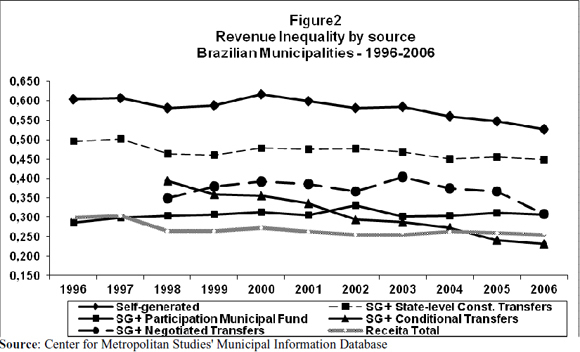 Instead of an outcome associated with tax competition, Brazil's fiscal rules clearly reduce revenue inequality among municipalities. Whichever of the federal transfers we take - the Municipal Participation Fund or the Unified Health System and the Fund for the Maintenance and Development of Basic Education and the Advancement of Teaching - and the same for negotiated transfers, the data confirms the proposition that the poorest jurisdictions are those that most benefit from the redistributive role of transfers. Moreover, revenue inequality reduction is not associated with political negotiations to form coalitions in support of presidential legislative initiatives. Instead, distributive mechanisms work in highly predictable ways; after all, they are governed by constitutional and infra-constitutional rules. Rules regimenting the spending of Brazil's subnational governments constitute a central component of federal policies governing decentralization. These rules limit the decision-making autonomy of constituent units in relation to the allocation of their resources. As previously discussed, these rules do not represent a new component of the federal regulations that govern subnational entities. In effect, "binding" constituent units to desired spending behaviors through constitutional imperatives was a feature of the 1946 Constitution, and served to link a small amount of revenues to developmentalist goals. More recently, the Calmon Amendment and the Constitution of 1988 earmarked subnational revenues to education (Arretche, 2006). With regards to urban development, such as urban infrastructure, housing, public transport, and sanitation, the influence of federal regulation is much more limited. Although municipal governments receive transfers to implement these policies, they are neither universal nor regular. Furthermore, spending in these areas is not constitutionally determined. In other words, subnational governments enjoy considerable autonomy in implementing these policies. (i) regulated: those in which federal legislation and supervision limit the decision-making autonomy of subnational governments, establishing spending levels and standards for policy implementation. (ii) non-regulated: those in which policy-making is associated with autonomy in policy decision-making. In this study, regulated policies apply to public education and health care, whereas non-regulated policies are urban development (housing and urban infrastructure), and public transport. It is important to note, however, that this analytical distinction is not an attribute of public policy, but rather an attribute of central-local relations that in turn affects the decision-making autonomy of the government level in charge of implementation. As a hypothetical situation, a constitutional mandate that municipalities spend one percent of their revenues on public housing would be considered a regulated policy. Similarly, a federal policy that creates regular and universal transfers for transportation policies in metropolitan centers - and earmarks municipal budgets to this end - would imply federal regulation for relevant municipalities. It is therefore central regulation that converts a municipal policy into a regulated one. Given the characteristics of Brazilian federalism, the possibility exists to regulate subnational budgets in any area of public policy. The concept of regulation advanced in this study refers to an upper-level government authority to establish the rules policies implemented by subnational governments as well as its authority to supervise them. As Brazil's municipalities are considered "equal units" as providers of public services, it is possible to examine the effect of federal regulation - its presence or absence - on their spending behavior. Two interconnected effects - however different - can be examined. The first refers to discordance among jurisdictions, and the second to territorial inequality. The extent to which subnational governments discord among themselves, or vis à vis the federal government, can be measured by the priority conferred to each policy area. It can be evaluated by levels of spending. Inequality in spending, in turn, refers to the distance between a hypothetical situation - in which all jurisdictions would have the same spending per capita - and actual levels of per capita spending. This can be measured by the Gini coefficient. The box-plot in Figure 4 illustrates the same data, but refers to spending on education. For half of Brazil's municipalities, variation in spending priorities in this area hovers around an median value of 25 percent, which indicates that they obey constitutional rules. The interval in variation for all municipalities falls between 10 and 50 percent of total spending. In this particular policy, we find a behavior similar to that which is encountered in public health spending, although the internal variation is larger. 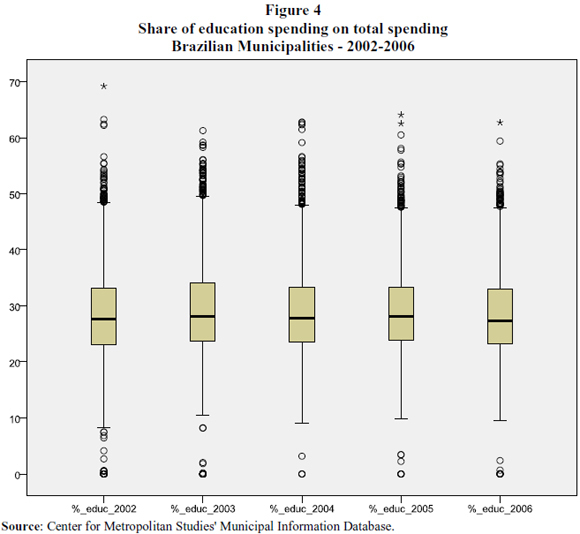 In general, Brazil's municipalities confer high priority to education. Figure 5 presents the same data in housing and urban spending. The results indicate that spending in this area receives low priority in the budgetary decisions of municipalities. Twenty-five percent of municipalities allocated between zero and five percent of their spending to these policy domains. Note that the variation hovers around a median of approximately ten percent of total spending - a lower outlay than is observed in regulated policies. In sum, the data indicate that housing policies and urban infrastructure receive less priority from municipal governments. Finally, Figure 6 presents the same information on spending for public transport. This policy clearly receives low priority among all municipalities. It tends to reflect behavior that is considerably homogeneous; that is to say that there is a concentration around the median, below five percent. Twenty five percent of municipalities applied close to zero in this policy, indicating a virtual absence of priority in this area of public spending. Observe that a group of outliers gave high spending priority to this area. 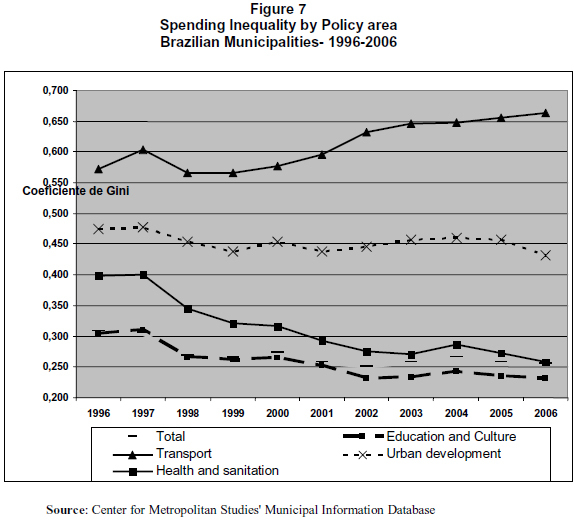 In sum, the spending priorities of Brazil's municipalities illustrate a clear pattern. Regulated policies receive high priority in municipal expenses, whereas non-regulated areas do not. This behavior is not a random result; it can be explained by central-local relationships and by the convergence produced as a result of federal legislation and supervision. On the other hand, we cannot ignore variation in the priority accorded to different policies, in and of themselves. Despite regulation, there are municipalities that discord with the priorities of others. This brings us to the issue of inequality. Figure 7 presents Gini coefficients on municipal spending in each one of the policies previously examined,15 from 1996 to 2006.16 As illustrated by the data, regulated and non-regulated policies exhibit clear different patterns: horizontal inequality in regulated policies is much smaller than is the case with non-regulated ones. Spending in public education and culture presents the smallest Gini coefficient - and as early as 1996 (0.304). The introduction of the Fund for the Maintenance and Development of Basic Education and the Advancement of Teaching reduced inequality in spending: from 0.266 in 1998 to 0.232 in 2006. Conversely, public health and sanitation evince a Gini coefficient that is considerably higher than what is observed in the case of spending on public education and culture (0.399) in 1996. The implementation of the Ministry of Health's Operational Norms in 1996-98 implied a reduction in the inequality of spending, to 0.345, in 1998. Additionally, the introduction of the constitutional amendment 29/2000 marked a point of inflection for the Gini, which fell to 0.293 in 2001. The trajectory trended downwards, until the last year of the data series: 0.259 in 2006. The coefficients of regulated policies remained basically identical beginning in 2004, when conditional transfers and federal earmarking of subnational revenues were fully incorporated into public health and education policies. This outcome means that central regulatory mechanisms produced similar results on the horizontal spending inequality in health and education. In effect, both policies are affected by similar regulatory mechanisms: earmarking of subnational revenues and earmarked conditional transfers. The same can be said about non-regulated spending in urban housing, infrastructure, and transport. These areas present higher levels of spending inequality. The Gini coefficient for urban housing and infrastructure was high at the beginning of the data series (0.474) and it remained consistently high throughout the period. In 2006, the Gini coefficient was 0.432. With regards to public transport, the horizontal inequality of spending also trended upwards, with a 15 percent increase in the Gini coefficient, from 0.572 in 1996 to 0.663 in 2006. 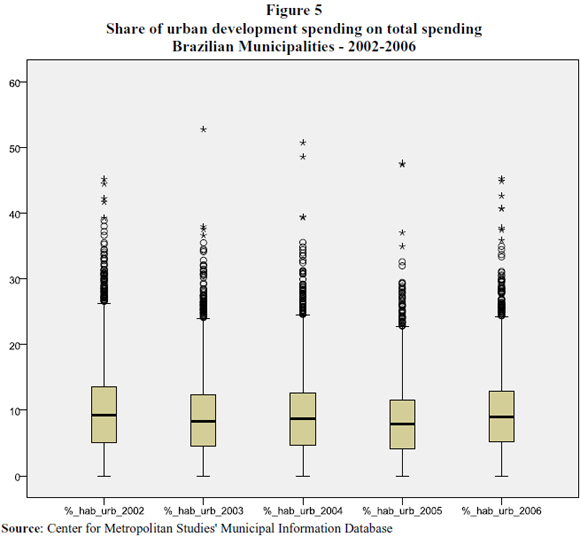 In short, there is a clear pattern of spending inequality among Brazil's municipalities. In the areas of health and education - regulated policies - the inequality in spending is much reduced, whereas non-regulated policy domains reflect significant disparities in per capita spending. What mechanisms can explain this result? Note that the Gini coefficients of regulated policies have values that approximate municipal revenues. The inequality of spending for regulated policies, therefore, is the result of a combination of the redistributive outcome of federal transfers with central-led regulation on spending - which puts conditions on revenues, earmarking them to selected policies. The absence of federal regulation therefore implies higher inequality in spending among jurisdictions. It ought to be reiterated that this is not a random result, nor an expression of chaotic behavior. Instead, it can be explained by central regulation employed to "bind" local governments to specific policies. It consists of earmarking municipal revenues with spending functions and supervising them by means of Brazil's auditor general (Tribunais de Contas). Revenue place-inequality, by its turn, is reduced by the redistributive role performed by federal transfer. In theoretical terms, reducing territorial inequality presupposes that the central government is simultaneously advancing regulatory and redistributive measures. The data presented above indicate that, despite the convergence effect produced by federal regulation, there is considerable variation in how municipal governments accord their spending priorities, even for regulated policies. It means that the autonomy of local governments over their own policies operates toward variation. In theoretical terms, the possibility of discord, derived from the autonomy of local governments, operates in the sense of territorial inequality. The combination of these two dimensions, that is, the centralization of authority combined with the possibility of discord is a central characteristic of the Brazilian federalism.Â Federal regulation operates in the sense of producing centripetal results. By contrast, the autonomy of local governments tends towards inequality. Â It is the combinatory effect of both that best explains central-local relations in Brazilian federalism. Therefore, an adequate interpretation of "the particular nature of Brazilian federalism" must take into account these two dimensions. In the presence of both (that is, in regulated policies), territorial inequality is bounded. In the absence of such regulation, the chances that a policy will assume priority are small; hence, spending inequality will be much larger. The evidence presented in this paper does not confirm the expectation that Brazilian federalism can be aptly described as devoid of coordination. If our federal institutions produced, in effect, a Tieboutian world in which each jurisdiction advanced a strategy based on competition - derived from full tax and public policy autonomy - the expected result would be a "race to the bottom" in public spending. Each jurisdiction would try to get rid itself of the poor and attracting wealthy taxpayers, both citizens and businesses. Instead, the results show priority to spending in public health and education, which primarily benefit the poor. The explanatory mechanism for this observed behavior is the regulation and supervision of the central government. Similarly, in a federalism characterized by praetorian competition, high inequality in revenues among jurisdictions would be the most likely result. But in the Brazilian case, the central government has assumed a role in which it reduces the inequality of revenues among jurisdictions. These results confirm the proposition that there is a trade-off between the reduction of territorial inequalities and the full autonomy of local government competencies. The centralization of revenues appear to provide a mechanism to reduce inter-jurisdictional inequalities in revenues. In the absence of transfers, the capacity of Brazil's municipalities to provide public services would be highly unequal. Furthermore, federal regulation appears to be a condition for "binding" independent subnational units to a nationwide national goal. The pattern of spending among local governments - that is, high priority and low inequality in regulated policies as well as low priority and high inequality in non-regulated policies - clearly demonstrates the impact of federal regulation on the decisions of local governments. This is not necessarily a zero-sum game, however; each level of government undertakes different roles. While the central government commits local governments to certain policies - through its regulatory powers - and thus avoids a race to the bottom in public health and education spending, local governments maintain authority over the implementation of policies. Hence, their political autonomy permits for the possibility of discord. As a result, even under the imperative of federal regulation, there is space for decision-making on the part of local governments. In this way, instead of a zero-sum game, the combination of federal regulation and the possibility of discord on the part of Brazil's constituent units implies limited inter-jurisdictional discord. This is to say that the extent of discord tends to be constrained by federal regulation, while the potential for discord explains differences among jurisdictions. Federal regulation operates in a uniform sense, whereas local autonomy operates in a variable fashion. Given these conditions - the simultaneous presence of federal regulation and local autonomy - the inequality among jurisdictions tends to be circumscribed. It tends to vary within intervals. In the presence of these two conditions, bounded territorial inequality tends to be the most probable outcome. The impact of federal regulation is one of the reasons behind the absence of any relationship between subnational governments' spending pattern and mayor's partisan affiliation. Rather than being the expression of a programmatic fragility of Brazil's political parties, this result reflects the fact that the subnational expenditure decisions are affected by central regulation. Independent of local median voter preferences, federal legislation constrains how mayors use their revenues. Given that these budgets are fixed, the effects of this regulation affect not only the spending on regulated policy, but also the resources available for non-regulated policy spending. In effect, the absence of a relationship between spending levels and local partisan preferences is the expected result of federal regulation. 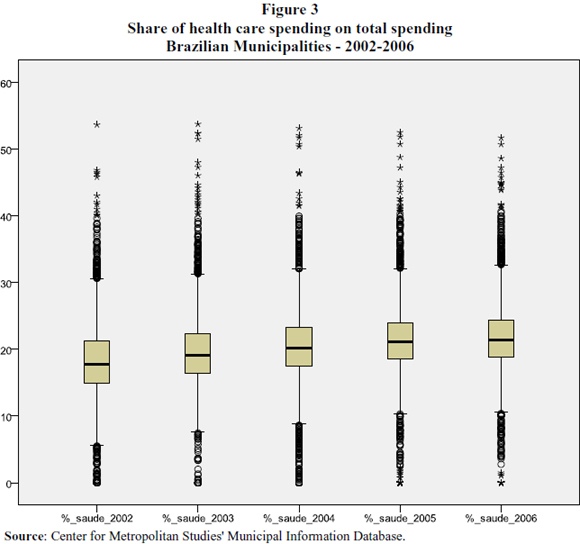 If political coalitions favorable to spending on public health and education - which benefit the poorest - were predominant among Brazilian jurisdictions, there would be no reason for federal regulation to obligate mayors and municipalities to allocate revenues to these policies. It is precisely the belief that this spending would not command priority from local politicians that lies at the origin of these policies. Therefore, federal regulation seeks to protect predetermined policies, regardless of the number of voters whose preferences prioritize this type of policy spending. Given the evidence presented, interpreting federal transfers as mere pork barrel spending tends to underestimate their nature, origins, and results. The most significant portion of federal transfers in Brazil is marshaled to reduce territorial inequality in spending capacities. Historically, these have assumed an important role in Brazil's formation as a nation, similar to other federations, in which the idea of nationhood prevailed over regional autonomy. As early as the Constitution of 1946, inter-governmental transfers were adopted together with constitutional rules to earmark subnational revenues to national policy priorities. Therefore, far from permitting local governments to freely allocate revenues gleaned from other jurisdictions, the logic of this arrangement aimed to limit the latitude of local governments in deciding how national revenues would be prioritized. More recently, the constitutionally mandated transfer of resources adopted in 1988 were accompanied by limited authority for local governments. In the mid 1990s they increasingly guaranteed that local revenues would be effectively allocated to policy objectives as determined by the central guidelines. Regulated policies therefore have a different nature than the pork barrel; they aim to reduce the unchecked decision-making autonomy of subnational governments. That is to say, they are based on the belief that local authorities would not likely allocate spending to social programs if they were to enjoy full autonomy over revenues and spending. It is, however, the perception of belonging to one national community that justifies a reduction in inequality and, in turn, the federal policies that advance this goal. 1. With regards to the First Republic, see Hochmann (2006). On the Constitution of 1946, see Souza (1976). On the democratic period from 1946-64, see Santos (1987). On the constitutional assembly of 1987-88, see Souza (1997). On the current democratic regime, see Abrucio (1998) and Stepan (1999). 2. The importance of this relationship was implicitly assumed by econometric studies that measured the impact of transfers on municipal governmental spending decisions (Sakurai, 2009). It was also assumed with regards to local elections (Ferreira e Bugarin, 2006). This article, however, adopts a broader perspective. It assumes that the distributive policies of the central government are not the only factors affecting the decisions of local governments. Instead, this study examines the impact of federal regulation over these decisions. Federal regulation is defined as the entirety of federal legislation over the policies of constituent units, the authority underlying the supervision of policies, as well as the function of redistributing revenues among jurisdictions. 3. Although this study takes municipalities as its empirical unit of analysis, I assume that similar results might be encountered if an analogous approach were taken in analyzing the decisions of state governments. 4. In his study on the formation of the Italian and German states, Daniel Zibblat (2006) demonstrates the role of central elite perceptions about the capacity of regional governments to undertake governing functions on the decision about authority decentralization. Bismarck and Cavour shared similar preferences with regards to adopting a federal formula. However, the former unified regions with strong governing capabilities, while, by contrast, Italy evinced an administrative fragility in the southern provinces that rendered a federal formula unviable. 5. The concept of decommodification refers to the capacity of social policies to guarantee citizens and their families an acceptable standard of living, independent of their insertion in the workplace (Esping-Andersen, 1990). 6. For more discussion on this issue, see Afonso e Araújo (2006); Pinto (2007); Prado (2001); and, Rezende (2006). 7. For an explanation regarding the logic associated with each one of these transfers, see Prado (2006: chapter 1). 8. The Operation Norm (Norma Operacional Básica) 1996/1998 - as with other operation norms - conditions federal transfers to adhesion to norms stipulated by the Ministry of Health. Furthermore, the Norm 96(98) reduces uncertainty regarding the flow of transfers, rendering their allocation more credible. 9. This brief description refers to the Fund for the Maintenance and Development of Basic Schooling and the Advance of Education Professionals (Fundo de Manutenção e Desenvolvimento da Educação Básica e de Valorização dos Profissionais da Educação), approved in 2006. This Fund substituted the Fund for the Maintenance and Development of Basic Education and the Advancement of Teaching (Fundo de Manutenção e Desenvolvimento do Ensino Fundamental e Valorização do Magistério). Both originate from constitutional amendments that condition the distribution of resources - within states - proportionately to the supply of education for each level of government. Â For a detailed analysis, see Vazquez (2003) and Gomes (2008). 10. A time series helps avoid problems associated with looking at discrete points in time. 11. The Federal Constitution of 1988 determined that subnational governments had to allocate, at a minimum, 25 percent of their tax revenues and transfers to education. This mechanism was not an innovation of the 1988 Constitution, but rather was taken from a Constitution Amendment approved in 1983. 12. The Constitutional Amendment nÂº 29/2000 defined an initial minimum level for the year 2000 of 7 percent of municipal and state revenues to be applied to health - an increase of 5 percent over the amount stipulated by the Ministry of Health in 1999. In subsequent years, until 2004, the percentages to be granted to states and municipalities were to be elevated to reach 12 percent of state revenues and 15 percent of municipal revenues; whereas the participation of the central government would be corrected by the GDP nominal variation. 13. To begin the dataset in 2002 permits a disaggregation of pertinent sub-functions, which is not possible for the period prior to 2001 (using data from the National Treasury Secretary). 14. The numbers displayed in the Figure refer to the municipal code, classified by the Brazilian Institute for Geography and Statistics (Instituto Brasileiro de Geografia e Estatística). 15. Initiating the analysis in the year 1996 has the methodological aim of evaluating the impact of the Ministry of Health Operational Norm's Â (96/98) introduction; and ditto for the Fund for the Maintenance and Development of Basic Education and the Advancement of Teaching, introduced in 1998, as well as the constitutional amendment 29/2000. 16. Until 2001, the accounting data of municipalities was available from the National Treasury Secretary, and it aggregated spending per function. A disaggregation by sub-function only became available beginning in 2002. To control for the trajectory of spending (a point in time before 1998), the analysis was realized by the functional classification standard. The analysis by function affects the inferences only marginally, because municipal spending in culture and sanitation are substantially lower than spending on public health and education. ABRUCIO, Fernando. (1998), Os Barões da Federação. São Paulo, Hucitec and Edusp. _____ e SOARES, Márcia M. (2001),Â Redes Federativas no Brasil: Cooperação Intermunicipal no Grande ABC. São Paulo, CEDEC/Fundação Konrad-Adenauer-Stiftung. AFONSO, José Roberto Rodrigues and ARAÚJO, Erika Amorim. (2006), "Local Government Organization and Finance: Brazil", in Shah, Anwar (ed.) (2006). Local Governance in Developing Countries. Washington: The World Bank. ALMEIDA, Maria Hermínia Tavares de. (2005), "Recentralizando a Federação?". Revista de Sociologia e Política, nÂº 24, pp. 29-40. ALMOND, G. A. and POWELL JR, G. B. (1978), Comparative Politics: Systems, Process, and Policy. (2Âª ed.). Boston, Little, Brown and Company. ARRETCHE, Marta. (2000), Estado Federativo e Políticas Sociais: Determinantes da Descentralização. Rio de Janeiro, Revan. _____. (2005), "Quem Taxa e Quem Gasta: A Barganha Federativa na Federação Brasileira". Revista de Sociologia e Política, nÂº 24, pp. 69-86. _____. (2007). "The Veto Power of Territorial Governments in Brazil: Political Institutions and Representatives Voting Behaviour". Brazilian Political Science Review, nÂº 2, pp. 40-73. _____. (2009). "Continuidades e Descontinuidades da Federação Brasileira: De Como 1988 Facilitou 1995". DADOS - Revista de Ciências Sociais, vol. 52, nÂº 2, pp. 377-423. BANTING, Keith. (2006). "Social Citizenship and Federalism: Is a Federal State a Contradiction in Terms? ", in Greer, Scott (ed. ), Territory, Democracy, and Justice. Regionalism and Federalism in Western Democracies. Londres, Pallgrave Macmillan, pp. 44-66. _____ e CORBETT, Stan. (2002), "Health Policy and Federalism: An Introduction", in Banting, Keith e Corbett, Stan (eds. ), Health Policy and Federalism: A Comparative Perspective on Multi-level Governance. Queen's University, Institute of Intergovernmental Relations. BIDERMAN, Ciro. (2005), "Políticas Públicas Locais no Brasil", in Arvate, Paulo e Biderman, Ciro (orgs. ), Economia do Setor Público no Brasil. Rio de Janeiro, Elsevier, vol. 1, pp. 462-492. BUCHANAN, James M. (1995), "Federalism as an Ideal Political Order and an Objective for Constitutional Reform". Publius: The Journal of Federalism, vol. 25, nÂº 2, pp. 19-27. CARVALHO, José Murilo de. (2001), Cidadania no Brasil. São Paulo, Civilização Brasileira. DRAIBE, Sônia. (1985), Rumos e Metamorfoses.São Paulo, Paz e Terra. _____. (1989), "As Políticas Sociais do Regime Militar Brasileiro: 1964-84", in Soares, Gláucio D. e D'Araújo, Celina. 21 Anos de Regime Militar. Rio de Janeiro, FGV. ESPING-ANDERSEN, G. (1990), The Three Worlds of the Welfare Capitalism. Princeton, Princeton University Press. FERREIRA, Ivan F. S. e BUGARIN, Mauricio S. (2006), "Transferências Voluntárias e Ciclo Político-Orçamentário no Federalismo Fiscal Brasileiro". IBMEC Working Paper, nÂº 16. GOMES, Sandra Cristina. (2008), Fatores Explicativos das Diferentes Estratégias de Municipalização do Ensino Fundamental nos Governos Subnacionais no Brasil. Tese de Doutorado em Ciência Política, FFLCH/USP, São Paulo. HOCHMAN, Gilberto. (2006). A Era do Saneamento. As Bases da Política de Saúde Pública no Brasil. São Paulo, Hucitec. LAMOUNIER, Bolivar. (1992), "Estrutura Institucional e Governabilidade na Década de 1990", in Velloso, João Paulo dos Reis (org. ), O Brasil e as Reformas Políticas. Rio de Janeiro, José Olympio. LEAL, Victor Nunes. (1949), Coronelismo, Enxada e Voto.Â São Paulo, Editora Alfa-Omega Ltda. LIJPHART, Arend. (1984), Democracies. Patterns of Majoritarian and Consensus Government in Twenty-One Countries. New Haven, Yale University Press. MANOW, Philip. (2005), "Germany: Co-Operative Federalism and the Overgrazing of the Fiscal Commons", in Obinger, H., Leibfried, S. e Castles, F. G. (eds. ), Federalism and the Welfare State. New World and European Experiences. Cambridge, Cambridge University Press. MARSHALL, T. H. (1967), "Cidadania e Classe Social". Cidadania, Classe Social e Status. Rio de Janeiro, Zahar. MOTA, Carlos Guilherme (org.). (1982), Brasil em Perspectiva. São Paulo: DIFEL, vol. 1. NUNES, Edson. (1997), A Gramática Política no Brasil: Clientelismo e Insulamento Burocrático. Rio de Janeiro, Zahar Editores. OBINGER, Herbert. (2005). "Austria: Strong Parties in a Weak Federal Polity", in Obinger, Herbert, Leibfried, S. e Castles, F. G. (ed. ), Federalism and the Welfare State. New World and European Experiences. Cambridge, Cambridge University Press. OBINGER, Herbert, LEIBFRIED. S. and CASTLES, F.G. (eds.). (2005), Federalism and the Welfare State. New World and European Experiences. Cambridge, Cambridge University Press. OLIVEIRA, Maria Lúcia de. (1977), "A Tendência à Centralização e o Fenômeno do Autoritarismo no Brasil". DADOS - Revista de Ciências Sociais, nÂº 15, pp. 83-99. PEREIRA, Carlos and MUELLER, Bernardo. (2002), "Comportamento Estratégico em Presidencialismo de Coalizão: As Relações entre Executivo e Legislativo na Elaboração do Orçamento Brasileiro". DADOS - Revista de Ciências Sociais, vol. 45, no 2. PETERSON, Paul. (1995). The Price of Federalism. Washington, The Brookings Institution. PINTO, Sol Garson. (2007), Regiões Metropolitanas. Obstáculos Institucionais à Cooperação em Políticas Urbanas. Tese de Doutorado, Rio de Janeiro, IPPUR/UFRJ. _____. (2006), Equalização e Federalismo Fiscal: Uma Análise Comparada. Rio de Janeiro, Konrad-Adenauer-Stiftung. RAZIN, Eran. (2007), "Introduction: Deconcentration of Economic Activities Within Metropolitan Regions: A Qualitative Framework for Cross-national Comparison", in Razin, Eran et al. (eds. ), Employment Deconcentration in European Metropolitan Areas. REZENDE, Fernando. (2006), "Os Desafios do Federalismo Fiscal", in Rezende, Fernando (ed. ), Desafios do Federalismo Fiscal. Rio de Janeiro, Editora FGV. RIBEIRO, Leandro Molhano. (2005), Partidos e Políticas Sociais nos Municípios Brasileiros. Tese de Doutorado em Ciência Política, Rio de Janeiro, IUPERJ/UCAM. SAKURAI, S. N. (2009), "Ciclos Políticos nas Funções Orçamentárias dos Municípios Brasileiros: Uma Análise para o Período 1990-2005, via Dados em Painel". Estudos Econômicos, vol. 39, pp. 39-58. SANTOS, Wanderley G. dos. (1979), Cidadania e Justiça. Rio de Janeiro, Ed. Campus. _____. (1987), Crise e Castigo. Partidos e Generais na Política Brasileira. Rio de Janeiro, Editora Vértice/IUPERJ. SÁTYRO, Natália Guimarães Duarte. (2008), Política e Instituições e a Dinâmica das Políticas Sociais nos Estados Brasileiros: Uma Análise após a Redemocratização. Tese de Doutorado em Ciência Política, Rio de Janeiro, IUPERJ/UCAM. SELLERS, Jefferey M. and LIDSTRÖM, Anders. (2007), "Decentralization, Local Government, and the Welfare State". Governance, vol. 20, nÂº 4, pp. 609-632. SIKKINK, Kathryn. (1993), Ideas and Institutions: Developmentalism in Brazil and Argentina. Ithaca, Cornell University Press. SCHWARTZMAN, Simon. (1982), Bases do Autoritarismo Brasileiro. Brasília, Universidade de Brasília. SHAH, Anwar (ed.). (2006), Local Governance in Developing Countries. Washington, The World Bank. SOUZA, Celina. (1997), Constitutional Engineering in Brazil; The Politics of Federalism and Decentralization. Houndmills/Londres/Nova York, Macmillan/St. Martin's Press. SOUZA, Maria do Carmo Campello de. (1976), Estado e Partidos Políticos no Brasil (1930-1964). São Paulo, Alfa-Ômega. STEPAN, Alfred. (1999), "Para uma Nova Análise Comparativa do Federalismo e da Democracia: Federações que Restringem ou Ampliam o Poder da Demos". DADOS Revista de Ciências Sociais, vol. 42, nÂº 2, pp. 197-251. TIEBOUT, Charles. (1956), "A Pure Theory of Local Expenditures". The Journal of Political Economy, vol. 64, nÂº 5, outubro, pp. 416-424. VAZQUEZ, Daniel Arias. (2003), Educação, Descentralização e Desequilíbrios Regionais: Os Impactos do FUNDEF. Dissertação de Mestrado em Economia, Campinas, SP, Instituto de Economia da Unicamp. WEINGAST, Barry. (1995), "The Economic Role of Political Institutions: Market-Preserving Federalism and Economic Development. The Journal of Law, Economics, & Organization, vol. 11, nÂº 1, pp. 1-31. WILDAVSKY, Aaron. (1984), "Federalism Means Inequality: Geometry, Political Sociology, and Political Culture", in Golembiewski, Robert T. e Wildavsky, Aaron (ed. ), The Costs of Federalism. New Brunswick/London, Transaction Books, pp. 55-69. ZIBLATT, Daniel. (2006), Structuring the State: The Formation of Italy and Germany and the Puzzle of Federalism. Princeton, Princeton University Press. * This article is a revised version of the paper "Federalism and place-equality policies: a case study of policy design and outputs", published as a Working Paper by the Department of Social and Political Sciences of the European University Institute. Preliminary versions were presented at the Joint Sessions of the European Consortium for Political Research (in Rennes, 2006) and the International Political Science Association Meeting (in Santiago, 2009). The research that gave origin to this article was made at the Center for Metropolitan Studies, with the support of the Fundação de Amparo à Pesquisa do Estado de São Paulo (Fapesp). Its results are part of an on-going comparative research by the International Metropolitan Observatory (IMO). I am particularly thankful to Jefferey Sellers, Charles Jeffery, Fernando Rezende, Daniel Vazquez,Â Sandra Gomes, as well as Revista Dados's reviewers for their comments and suggestions. I also thank Edgard Fusaro and Daniel Arias Vazquez for their valuable collaboration in statistical support.